↑ ୧.୦ ୧.୧ ୧.୨ ୧.୩ ୧.୪ ୧.୫ ୧.୬ Fitzgibbons RJ, Jr; Forse, RA (19 February 2015). "Clinical practice. 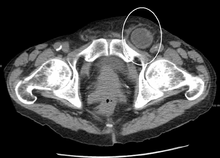 Groin hernias in adults". The New England journal of medicine. 372 (8): 756–63. PMID 25693015. ↑ ୩.୦ ୩.୧ ୩.୨ ୩.୩ ୩.୪ Roman, S; Kahrilas, PJ (23 October 2014). "The diagnosis and management of hiatus hernia". BMJ (Clinical research ed.). 349: g6154. PMID 25341679. ↑ Nigam, VK (2009). Essentials of Abdominal Wall Hernias. I. K. International Pvt Ltd. p. 6. ISBN 9788189866938. ↑ "Hernia Causes". Retrieved 2010-05-24. ↑ Desarda MP (2003). "Surgical physiology of inguinal hernia repair—a study of 200 cases". BMC Surg. 3: 2. doi:10.1186/1471-2482-3-2. PMC 155644. PMID 12697071. ↑ "Hernia Surgery". Hernia Symptoms. Retrieved 11 October 2011.